Taxonomy is the branch of science devoted to the sorting and categorization of organisms, but there’s no reason why its basic tenets cannot be applied to Skittles, Starbursts, Nerds, and M&Ms (both plain and peanut). In 2005’s Charlie And The Chocolate Factory, Freddie Highmore memorably argued, “Candy doesn’t have to have a point. That’s why it’s candy.” That logic-flouting opinion, however, is evidently not shared by Chicago’s Field Museum Of Natural History. 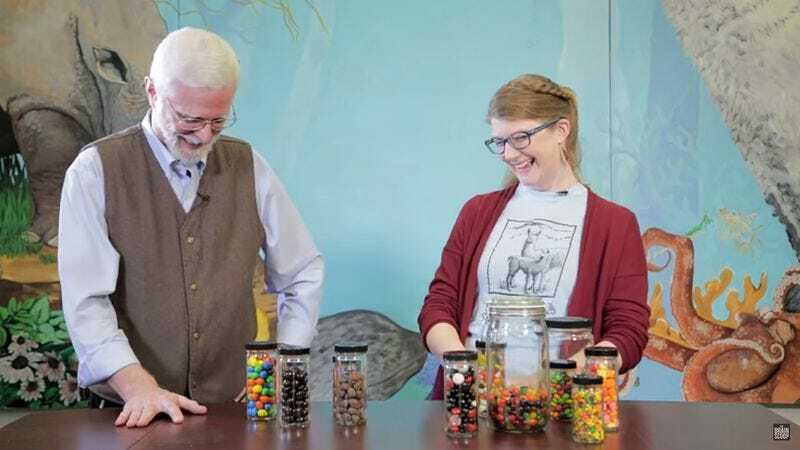 The institution has devoted an episode of its webseries The Brain Scoop to “The Taxonomy Of Candy.” Here, at the behest of host Emily Graslie, four experts on taxonomy are presented with jars of carefully segregated candies and then asked to group them in the most logical, evidence-based way. “We wanted to get them to look at something in depth that maybe they hadn’t considered classifying before,” Graslie explains. This presents a number of scientific and philosophical challenges to the Ph.D holders. Does one categorize candy by size, color, or contents? Should chocolate-based candies form their own group? And what to do with Jelly Belly jelly beans, which come in such a staggering variety of flavors? There are no obvious answers. Margaret Thayer, an insect expert, takes the step of biting into one of the candies, something she would not ordinarily do as part of her job. She does admit to sniffing some of the bugs, however. And what about all those wonderful artificial colors? Is there some meaning lurking there? “We don’t put red bats and red foxes together,” says Larry Heaney, a curator of mammals. “We could put red candy together, and it makes perfect sense. Why not?” As in all such sorting, the taxonomy of candy is an effort to impose order on what might seem to be a chaotic world. Olivier Rieppel, a curator of fossil reptiles, uses this as a springboard to talk about larger topics: “Is it us that brings order to the world? Or is the world coming to us in an ordered way?” And all of that from a trip to the candy aisle at the local supermarket.